Sewing is one of my crafty loves, and quilting is my nemesis! There has always been something too mathematical with quilting for me, and so I have always felt challenged when attempting this type of project. I have taken classes and learned to get over my apprehension. However, when it comes to making the Dresden deign in quilt making, I have not been very successful, until now! 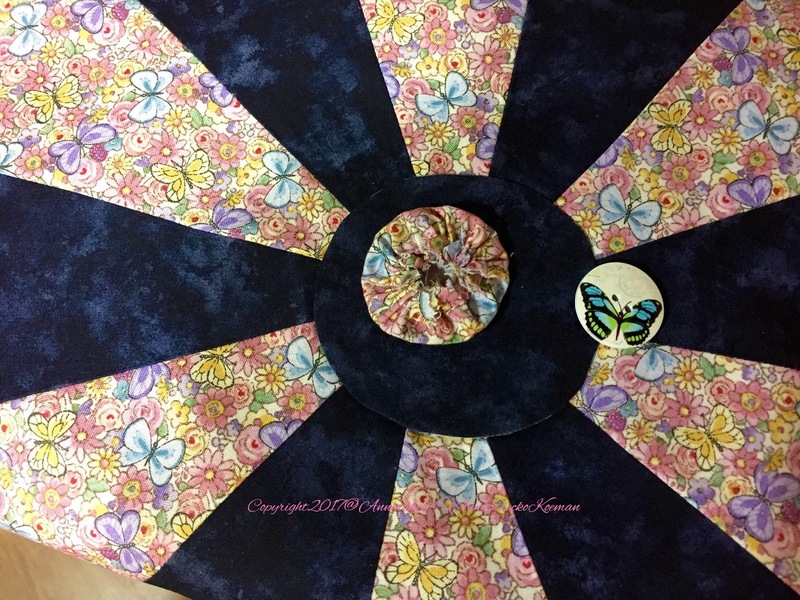 New and on sale for a limited, time is the Kaleidoscope Dresden Template and Pattern available from Nancy's Notions $9.99 instead of $17.99usd. Which I highly recommend! 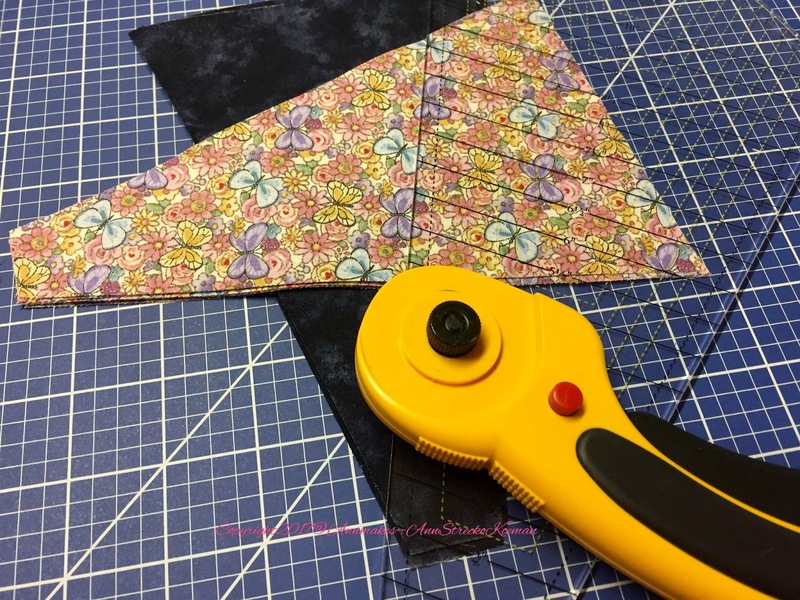 This tool and the instructions have turned me into a master quilter. Ok, that's an exaggeration...however I am confident that I can now make those once dreaded Dresden. 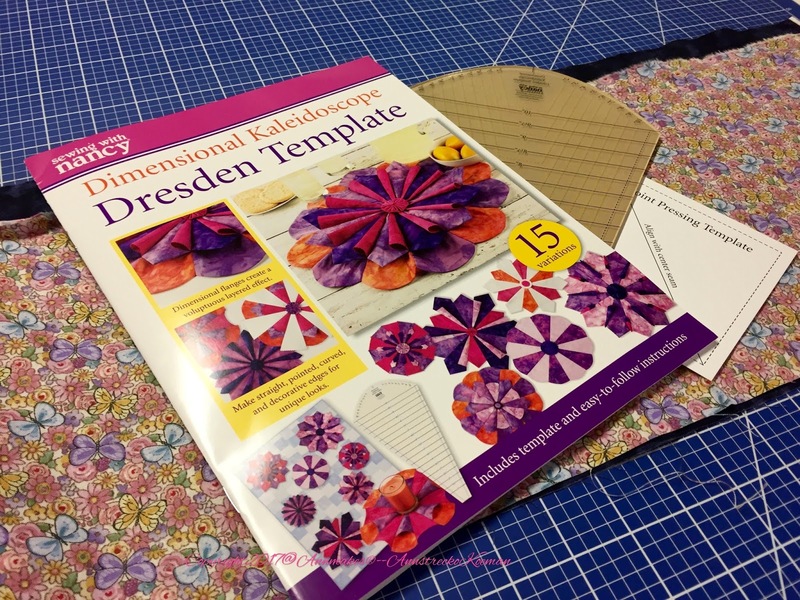 The Dimensional Kaleidoscope Dresden Template book, along with the clear acrylic template changes everything. Make perfect pieces with this tool. I can hardly believe how comfortable I find making these now. I look forward to making all 15 variations! The instructions are easy-to-follow in the 20-page booklet, with its many clear images and pictures. Making each of the Dresden, or the Dimensional Kaleidoscope Dresden requires minimal fabric. 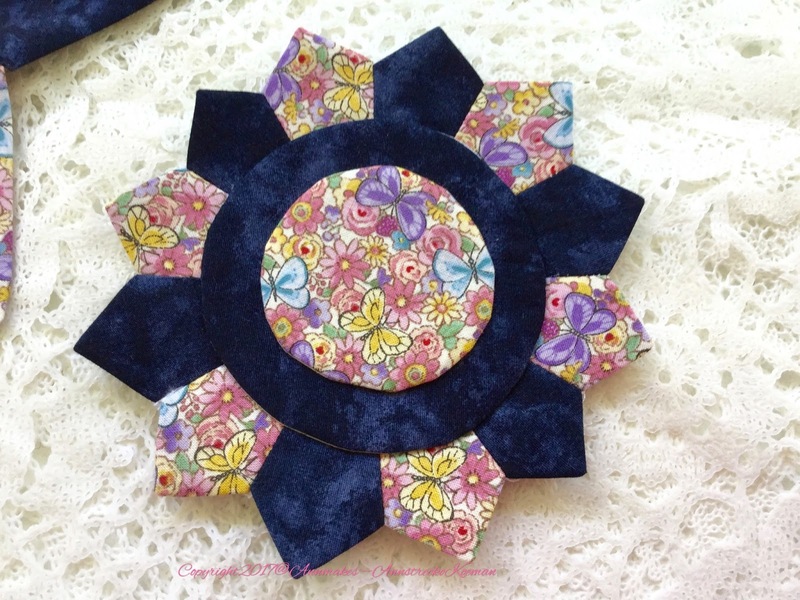 I was able to make mine with some scraps of fabrics, from pieces I got at Nancy's Notions. 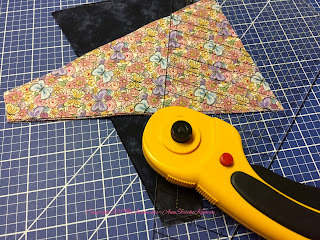 To begin all I needed to do was to make sure the fabrics I chose were ironed and squared. I then lay the template over the fabric and cut the pieces with a rotary cutter and self-healing mat. For my first project, I concentrated on cutting and assembling the pieces together accurately. The template and my tools made that part so easy. 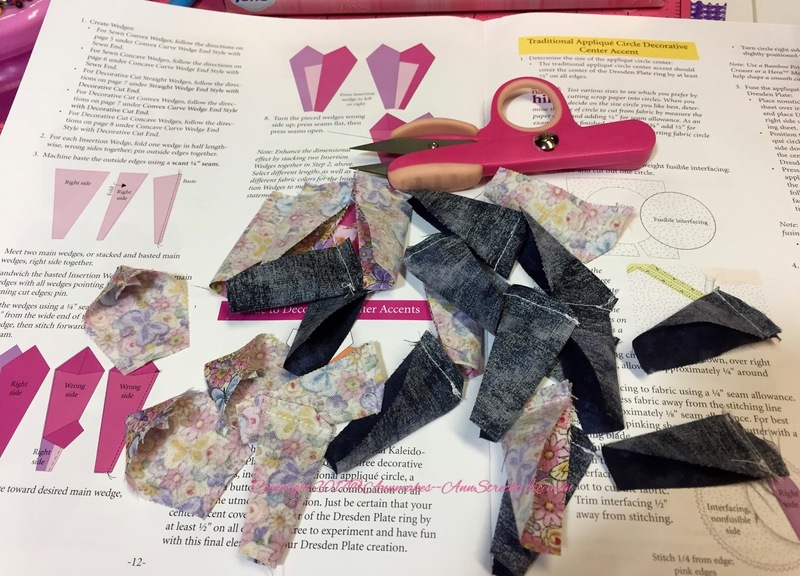 Next time I will add the dimension by cutting another set of wedges, and all I have to do is fold the extra wedges, fold them and sew them between each wedge. Easy peasy! I chose to make pointed the ends of each wedge. The cardboard template (included in the book) makes achieving the perfect score a piece of cake! 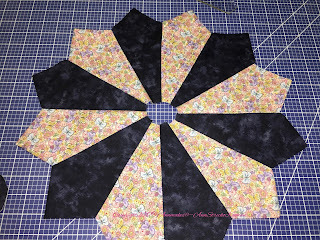 I liked the idea of using fusible interfacing to attach the center to conceal the hole in the middle. It is straightforward and quick. 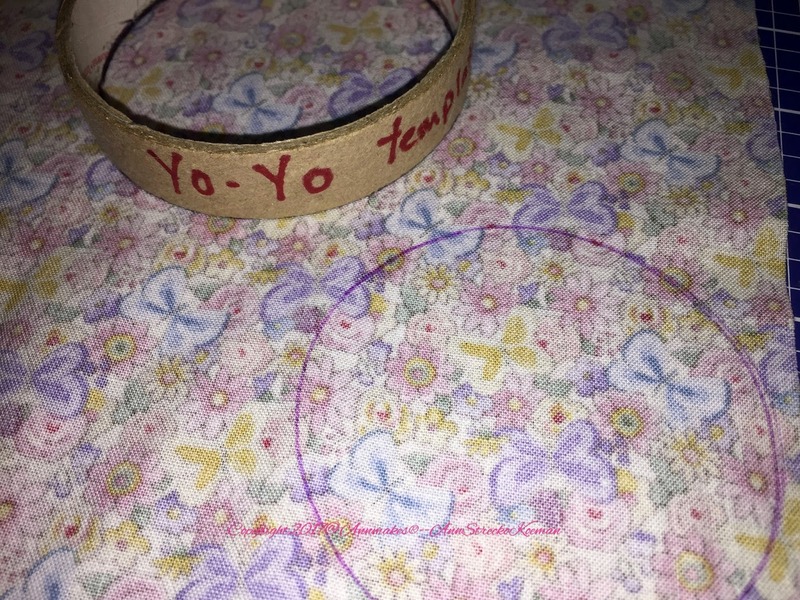 To make my circles for the center as well as the yo-yo, I traced around my homemade circle templates. You can see one in the photo above. 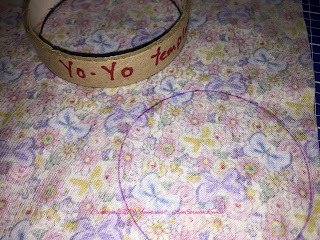 Once I ironed the solid colored circle to cover the hole, I sewed a yo-yo according to the instructions in the book. To complete the look I chose to sew on this button I had been saving for just the right project. 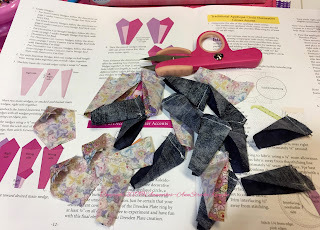 With the extra smaller scraps I had left over I had just enough to make two smaller Dresden. The template allows you to make wedges as small as one inch, and as big as 10 inches long. 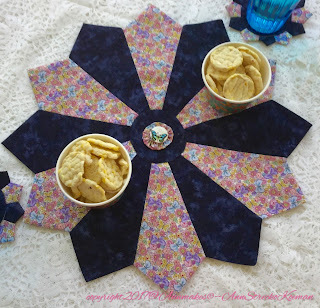 To accompany the table centerpiece, I made two smaller versions that to be used as coasters. I hope that you enjoyed reading this post and that you too will try to Dimensional Kaleidoscope Dresden to use in your home decor or quilts. Thank you so much for stopping by.